Nowadays we all know how hard it is to find lures that are different. Especially when it comes to crankbaits. 90% of all the crankbaits on the market, run in a similair kind of way. Each of them has their very own walk and wobble through the water, also known as the ”heartbeat”. If you would compare them to one and other, you would probably recon they are kinda similair. It’s not the diving lip that does the trick, but the shape of the bait that creates a unique movement through the water. When I first stumbled upon a photo of the Bondy Prophet Crankbait, it was love at first sight. I knew this was going to be something special! 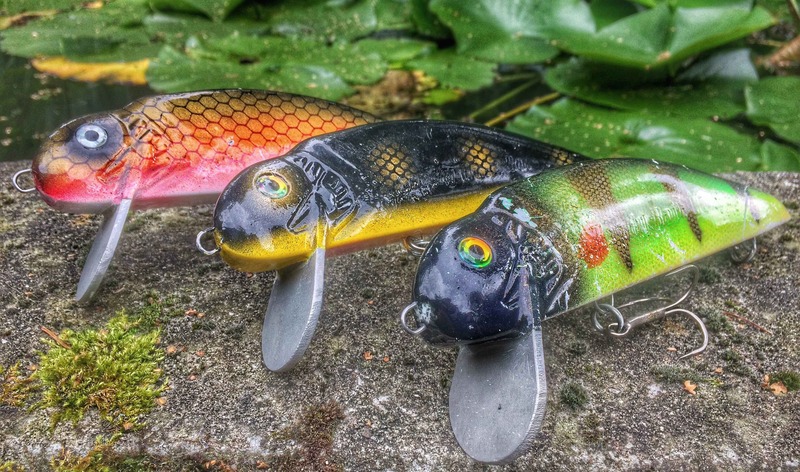 The Bondy Prophet Crankbait is a multi-year project from Jon. His vision was to create something indestructable featuring the same shape and size of an Original Bondy Bait. This crankbait is hand-made from solid plastic with a through wire construction. It has a custom cut 1/8″ thick aluminum lip which is cemented as well as screwed in, which makes this a super tough bait. Recently there was a video uploaded on his Facebook page, showing a bulldozer running over the lure, and after the lip was still intact. Now that’s what we call quality! The Prophet Crankbait is standard equipped with high quality split-rings and two 5/0 VMC round bend treble hooks. 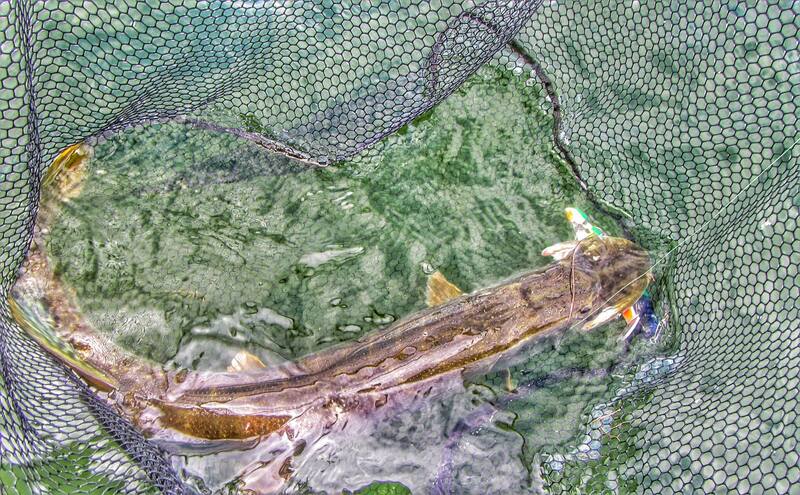 If you fish for Pike like me, I can highly recommend changing them for 2 Gamakatsu Treble 13B 3/0 hooks. 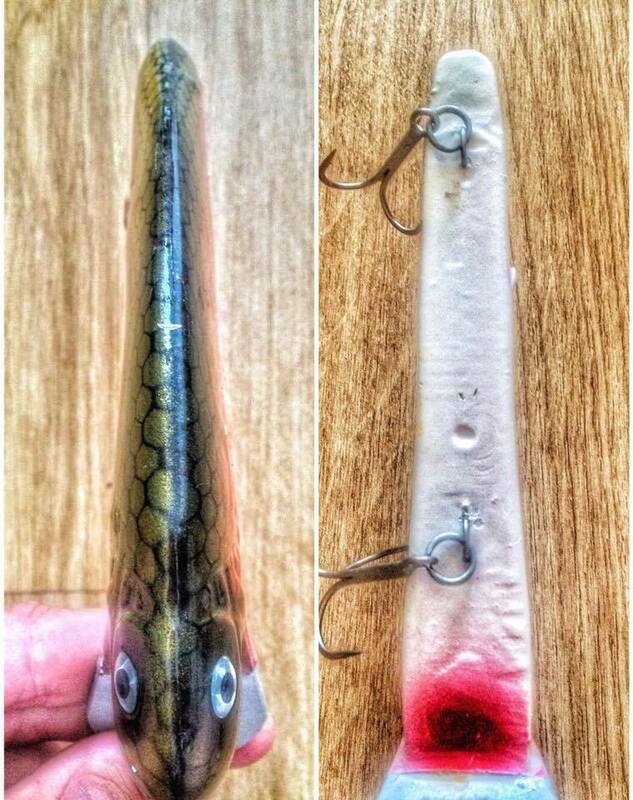 Not only are these way more sharp, they are also thinner which makes a huge difference in hook-ups. But that’s just a personal preference. Great colours for any type of conditions! 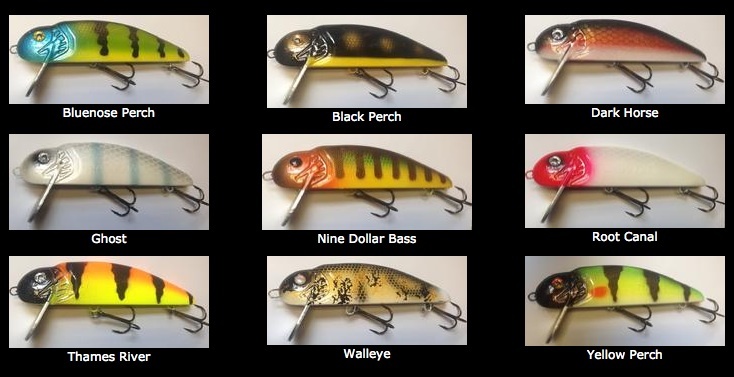 There are 10 colours available of this crankbait as you can see pictured above (Kentucky shad not included), so for every occasion there is something there. The colours on this bait are amazing and really stand out in the water. No way this one will go unnoticed, and alot of Pike have already experienced that. The Bondy Prophet Crankbait is a true (Big) fish catcher. It has become my go-to bait when the conditions are tough, and this one just delivers no matter what. Actually it’s quite funny, because this bait changed my way of fishing. Where crankbaits were only used for trolling before, I now find myself casting them way more often than I ever did. Like mentioned earlier, this bait has a unique shape and profile. Because of this, it sits high in the water, and is very bouyant. Wide underneath and narrow on top. If you look down on the bait, you’ll notice the center has a slight cut in the body, which is responsible for the action it creates. Due to the shape of the diving lip, you’ll need a heavy rod to troll or cast this crankbait, but that doesn’t matter because the strikes are ferociously hard. They go absolutely crazy for this thing! Explaining the action in words is a bit hard, so below you can see for yourself what it looks like! Like I said before, the Bondy Prophet Crankbait is hand-made. Now you might wonder why that matters, but I found out that no version is the same, which is truly awesome really! I have one version (Darkhorse) that is suspending, and the (Yellowperch) has an offset wobble, instead of straight. I don’t know if this is the case with all baits, but I’m happy mine are like this. It could have something to do with the pouring process, but other than that I have no idea. It doesn’t seem to have any effect on the depth rate or what so ever. Casted, this crankbait runs 2-3 feet, and trolled you can get it down to as much as 10 feet, which immediately makes this a great Winter bait as well! Of course, this all depends on what kind of gear your’e using, and the amount of line out. With 0.25mm Whiplash Pro and 32 yards of line, you’ll be able to fish it this way. Rumours are going on that Jon is working on a deeper version of this lure, so who knows what more is coming within reach upon us! Blackperch. A perfect colour for shallow clear water conditions. When it comes to fishing with this crankbait, the possibilities are endless. It’s not your ordinary crankbait. This is really something special. I have trolled this bait in open water where I have never caught fish on any other lure, but this one delivered. It’s hard to tell why things like these happen, but it’s definately the shape of the bait! You’ll notice when trolling, it has a very consistend and raw action. You will feel it’s ”heartbeat” inside your rod, and before you know it’s held back by a fish on the other side of your line. Like I said the strikes are tremendously hard! Propably one of my favourite things to do, is casting it. It weighs 4.4oz, so you can get away with a medium heavy rod. I use a 9ft 7oz Bulldawg rod for this. It’s nice and long, and you can cast it a mile away. Because of the hard pumping action created by the bait’s diving lip, I prefer a longer rod with more leverage and a 5:3:1 or 4:9:1 gear ratio reel from Abu Garcia. I have experimented with all kinds of different gear ratio’s and found that these ones worked the best. Slower won’t get the bait moving, and faster makes it dive too deep, so this way it can be perfectly fished in shallow water up to 3 feet. An ordinary shape on a unique crankbait! If you cast it out, reel it back in a steady way, but make sure to ”stop” the bait all of a sudden during it’s retrieve. Wait a few seconds and start reeling back in. Because of the bait’s high buoyancy, it will immediately sit in a 90 degree angle in the water, and will make it’s rise to the surface. If it happends to be that you own a suspended version, it will sit in the water this way, which makes it even more effective. I have found this is truly a deadly technique that will put fish in your boat, a 100% guarenteed! If you don’t already own one, you’ll know what to do! Get yourself one of these great crankbaits here. They are really worth the money, and made from top quality components. 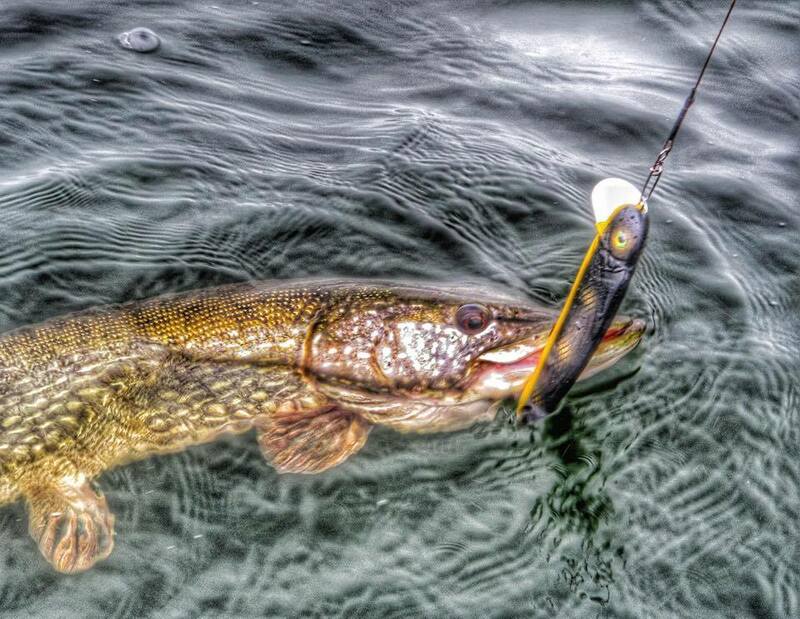 You’ll need it, cause any Muskie or Pike will hit it like there’s no tomorrow! T-boned by a big fish & safely in the net!